Benjamin Scheuer in “The Lion” at The Old Globe. Maybe you were wondering how The Old Globe would manage a solo musical on the White Theatre’s arena stage. I was. Would they have a turntable to rotate the performer in “The Lion,” so he could be seen from all sides? Nope. What they did was rotate the actor/singer/writer, Benjamin Scheuer, around the stage. The set (Neil Patel) comprises four chairs, six microphones and six guitars. 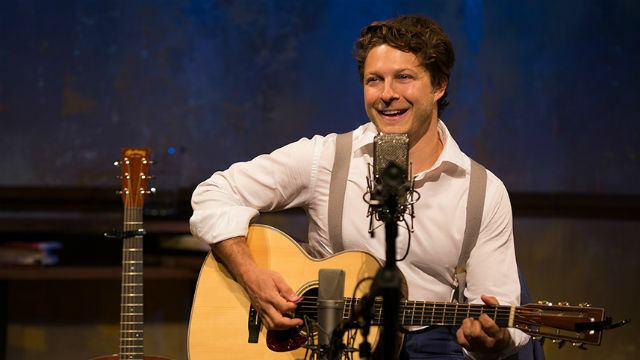 In relating his musical memoir, Scheuer moves from one chair to another, picking up and playing the various guitars (the detailed specifics of which are presented in the show’s program, for guitar aficionados, I guess). As a young boy, Ben’s aim in life was to play folk guitar like his father, a volatile mathematician who wanted no part of that scenario. Shortly after a big argument between the two, Ben’s Dad dies. Ben has carried that guilt around with him like his father’s old guitar. Now, in 70 minutes of song, he’s exorcising that demon, and telling his tales of love and life-threatening illness. Under the direction of Sean Daniels, Scheuer is an endearing performer, with his decidedly down-home look: suspenders and floppy, asymmetrical hair, and a pleasant, if not scintillating voice. His lyrics are precise and emotive, his songs poignant and often affecting, ranging from rueful to angry to life-affirming. His melodies, a mix of folk, bluegrass and rock, are likable enough, most jaunty in the opener and encore, the reminiscent “Cookie-Tin Banjo” (about his first instrument, that his father built). Mostly, they’re ballads, with a couple of electric guitar wails and rants added in during his times of peak anguish. While this is all moving and sweet, it makes one wonder: Is this show really big enough to be a feature of The Old Globe’s regular season? Maybe it should be a one-off (or a five-day stint like the two solo offerings recently featured by the La Jolla Playhouse). Scheuer isn’t an oversized, influential personality like Diana Vreeland (“Full Gallop” ran, to excellent effect, at The Globe in 1995 and again in 2015). His is a small, tender story that just isn’t expansive enough for a Globe stage. But for fathers and sons, especially, it’s a touching tale, affably told. Performances are Tuesday-Wednesday at 7 p.m., Thursday-Saturday at 8 p.m., Sunday at 7 p.m.; matinees Saturday and Sunday at 2 p.m. Additional matinee at 2 p.m. on Oct. 19; no matinee on Oct. 22; no evening performances on Oct. 9 and 23.